With Christmas right around the corner, I've been working on some DIY gifts. I've heard its a stage that a lot of kids go through, but my boys have been obsessed with money lately. Anytime I pull out my wallet, they start begging for pennies. My husband and I have been trying to teach them that money is valuable, and something we have to work for. 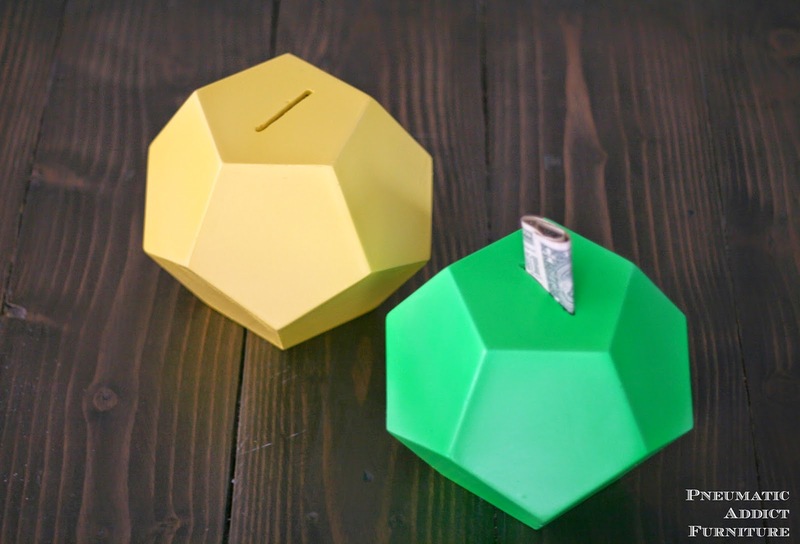 So, I decided to build them each a DIY coin bank. 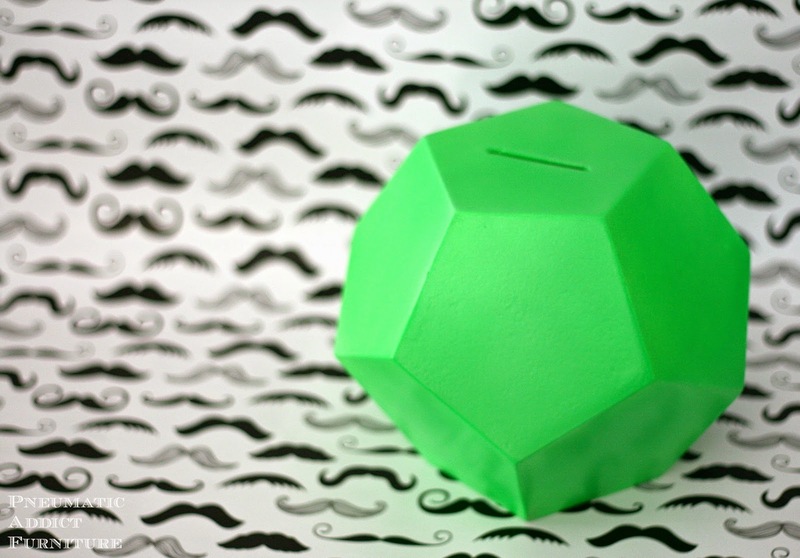 I wanted something a little more modern than the traditional piggy bank. 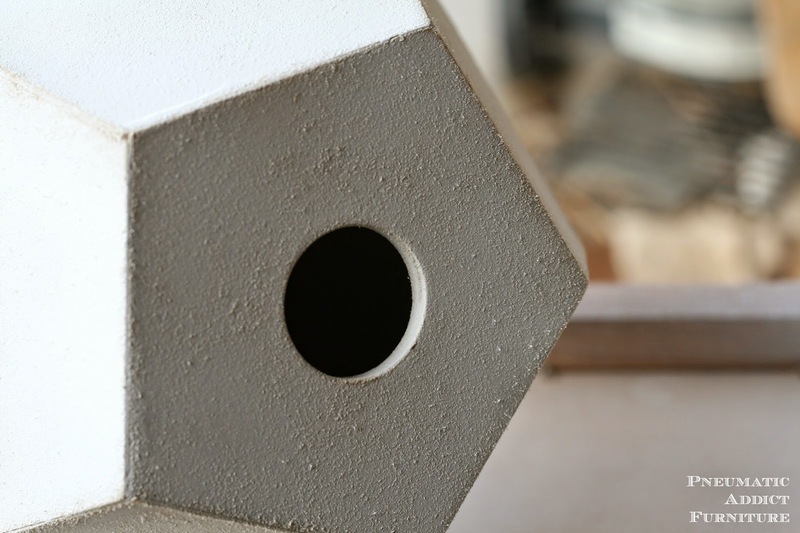 Once I saw these geometric lamps by Sarah M. Dorsey, I had my inspiration. Sarah and her husband already did all the hard work of calculating the angles of a dodecahedron (AKA, a 12-sided polygon), I just decided to shrink it down a bit. I started with a quarter sheet of 1/4" MDF, about $7 at Home Depot. I only used about half of the quarter sheet, for both banks. I ripped two 5" wide strips, lengthwise. If you don't have a table saw, you can ask someone at the hardware store and they will cut the sheet down for you. I printed off a 3.5" wide equilateral pentagon. When I traced the shape on the MDF, I made sure to leave a generous border and align one of the sides parallel to the edge, it makes it easier to cut that way. To make handling easier, I cut the strips into 24 equal pieces- 12 for each bank. Set your bevel (blade tilt) to 32.7 degrees and the miter (fence angle) at 18 degrees. Start with the edge of the MDF strip square against the fence and make your first cut. Rotate the freshly cut side to the fence and make your next cut. Work your way around, rotating the piece, till all sides are cut. Now, you have your template. 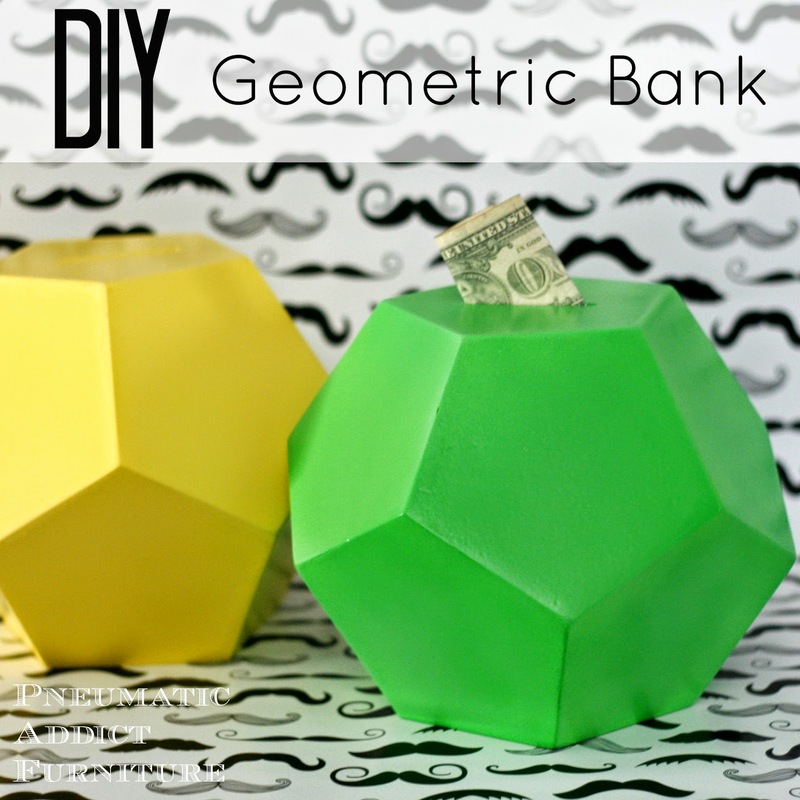 If making two banks, cut 23 more pentagons. 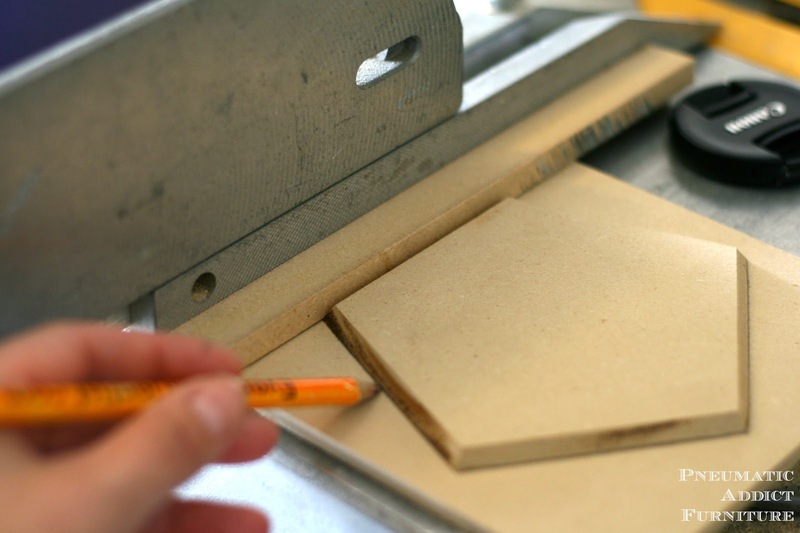 To make your life a little easier when tracing the template, line up the cut edge of the MDF against something vertical. First, place a small strip of scrap wood against the fence, then line up your template. This way you have extra material all around the perimeter and you are sure to be parallel with the edge. 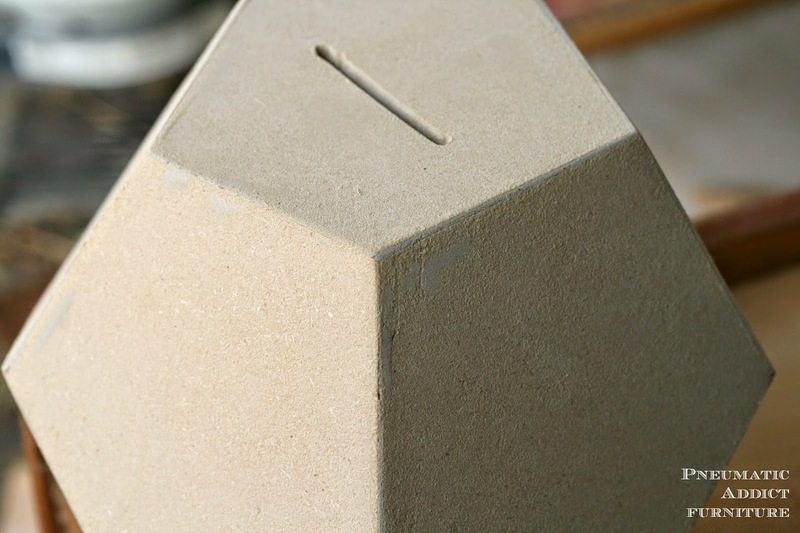 Each bank needs one pentagon, with a slit cut to drop the money through. If you love your router, you could use that, but I came up with a good alternative. 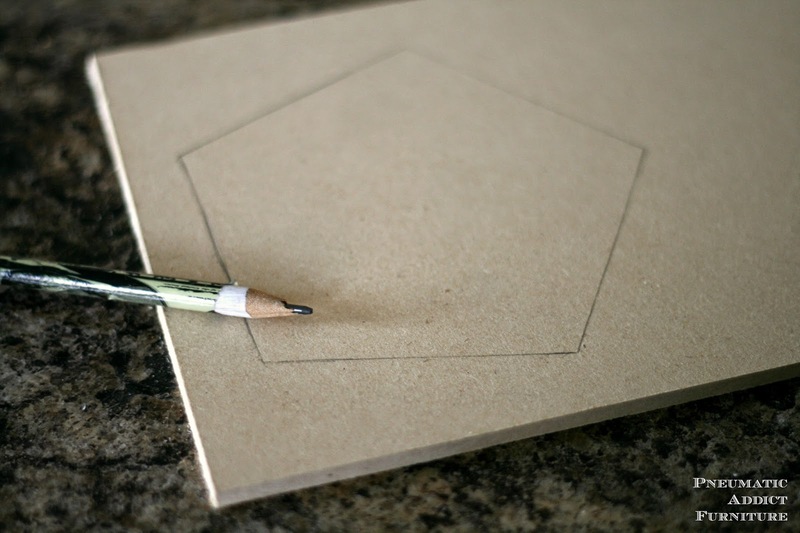 Draw a line of the larger side of one pentagon. 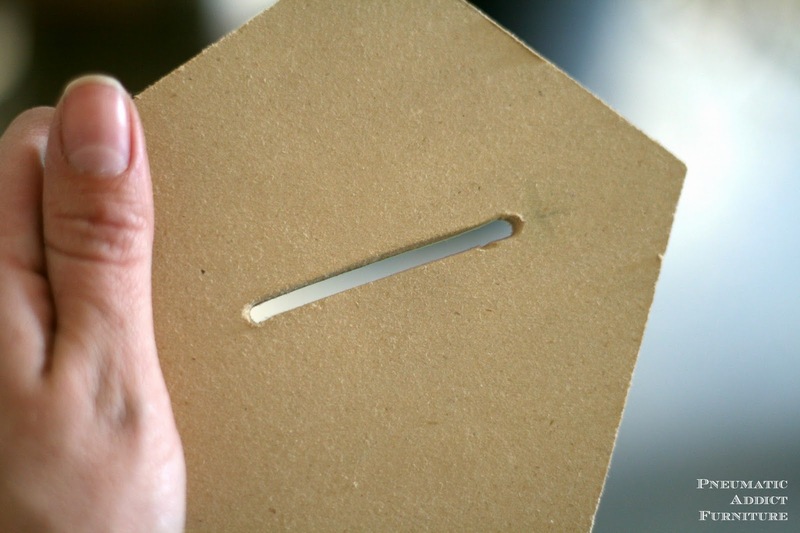 Use a 1/8" drill bit to drill a hole on each end of the line. 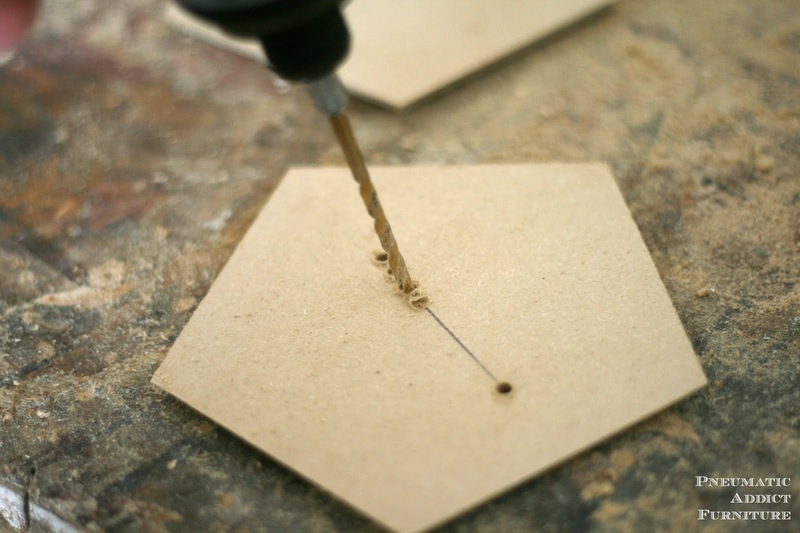 On one of the ends, drill a third hole immediately next to the other. Try to connect them. This will give you a slot to insert a jigsaw blade. Use the jigsaw to cut through to the last hole. I made a couple of passes to widen the opening. Each bank also needs a wide opening to access the money without having to smash the bank. Make sure its large enough for large coins to fit through. I used a 1 1/4" wide forstner bit, which I had lying around. Time to assemble. 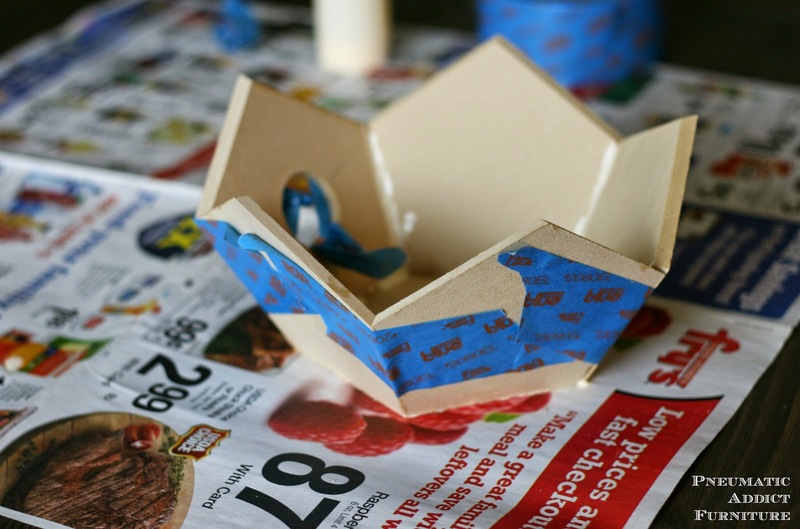 Use a generous amount of wood glue. Try to wipe off the access, but don't freak out. You can sand off the excess. Little tip, glued pieces bond together the best when glue is applied to both sides of a joint. 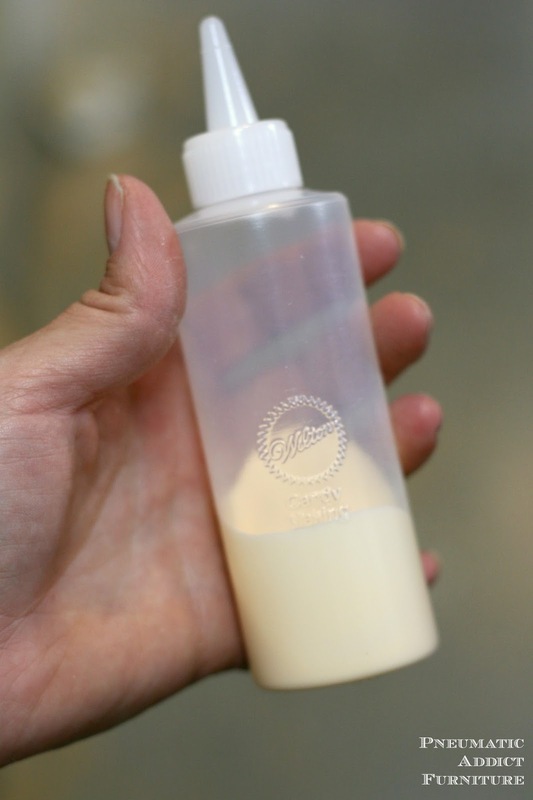 Speaking of glue; Instead of trying to wield a huge bottle of wood glue, I poured some glue in a decorating squirt bottle I picked up from Walmart. You can buy them *online here . They're pretty cheap and the small opening is a life-saver. The first two pieces were the hardest to get to stick. You may have to hold them together for a minute or two. I discovered several strips of masking tape held the pieces together pretty well. 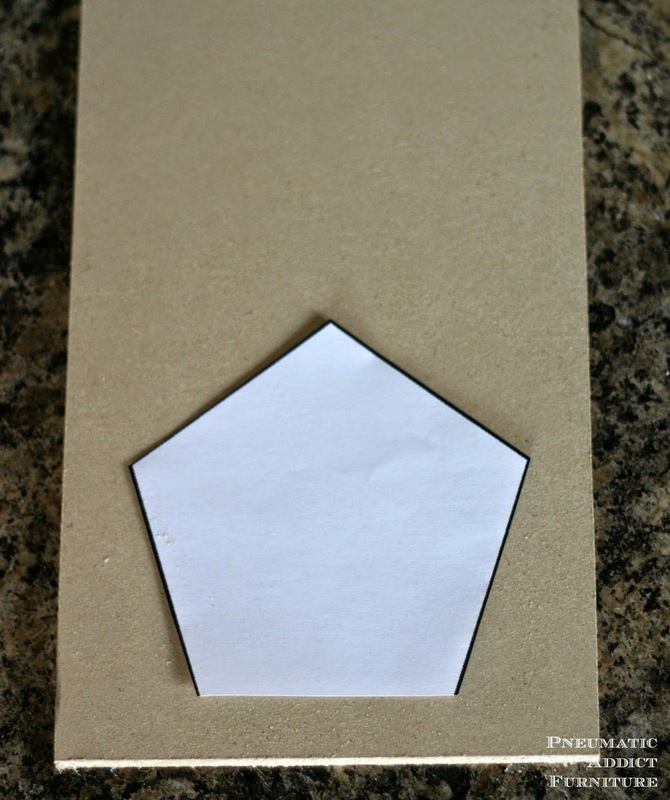 Place your pentagon with the large, round hole not on the bottom, but in the next row up. The second row and the top piece go on pretty easy. Once everything is glued in place. Let it dry overnight. Odds are every single seam won't be perfect. Don't sweat it. That's when wood filler comes in handy. I filled just about every joint and seam, let it dry, and sanded it smooth. At this point your bank is a blank slate. I kinda wish I had a daughter so I could have glittered one of these puppies. Instead, I layered on about 4 coats of spray paint and high gloss lacquer. MDF can be a bit tricky to spray paint. 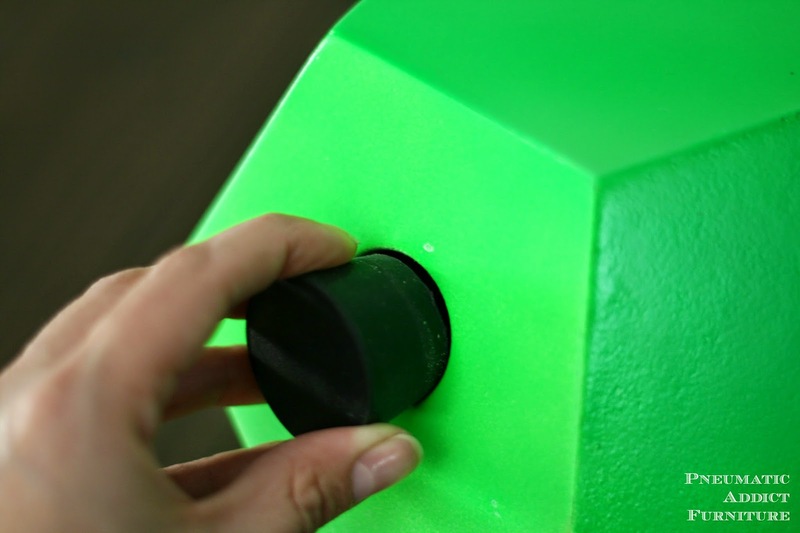 You can read my trick for spray painting MDF in this post. My local True Value is on of my favorite places in town. You can find almost anything there! In addition to nuts and bolts, they also carry corks and rubber stoppers. I went with the rubber stopper because I was afraid the cork might break apart and be impossible to remove. 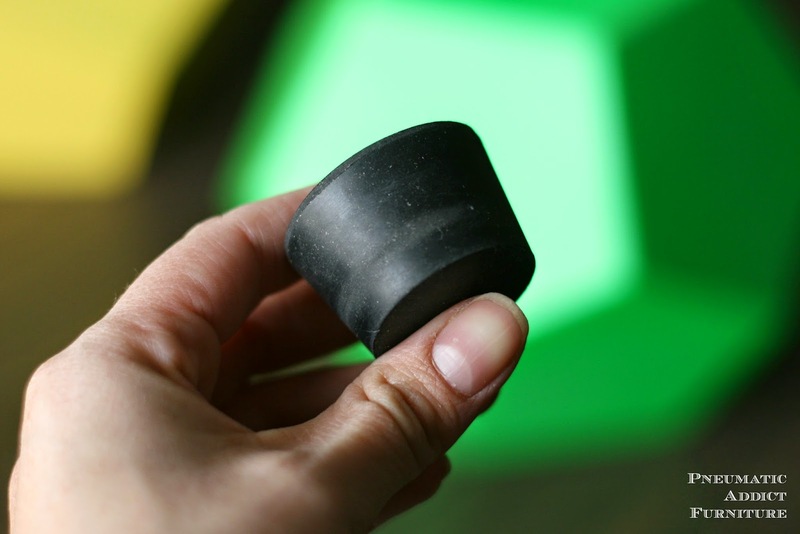 Go ahead, make your 'rubber plug' joke now. And here's how they turned out. I love them! I let the boys pick out their own paint colors. Ean went with lime green and Warren picked his current favorite color, yellow. I have to say, I was a little worried about the strength with the thin MDF and the hollow shape. That's the beauty of geometry. 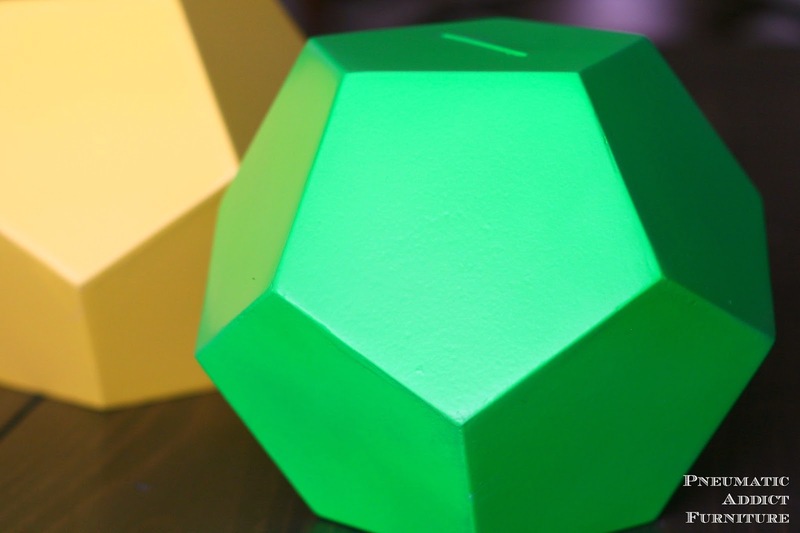 The interlocking sides actually give the dodecahedron a lot of strength. These little banks are tough. So what do you think? I guess I'm going to have to start carrying more change. I absolutely love this! I already have my DIY Christmas gifts in progress, but this is going on the list for future birthdays. Thank you! These are just awesome Elisha! Great tutorial too! I had my eye on the same lamp, what a brilliant idea to make it into a bank!